Poverty-traps and pay-gaps: Why single mothers need basic income – Dr Petra Bueskens. Harper discovered she wasn’t alone when she packed up her house, stopped paying rent and took her four-year-old son, Finn, on a six month “holiday” up north to warmer climes. Harper gave up her home because she couldn’t afford the rent and have any quality of life. Paid work put her in a double bind: if she worked, she lost most of her Centrelink payments; if she didn’t work there wasn’t quite enough to make ends meet. So, she worked and stayed poor. These are the poverty-traps that keep many single mothers working-poor and unable to dig out. 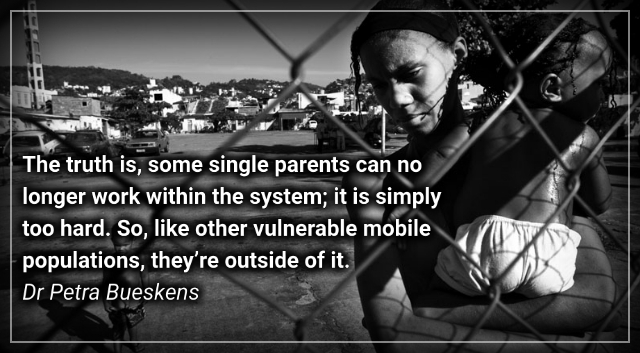 In Australia now, there is a clandestine group of mobile single parents, mostly mothers, who have found they cannot, on Centrelink benefits and low-paid casual work, meet the cost of living. They have chosen instead to travel and live with their children in camping grounds and caravan parks around Australia, particularly in Northern NSW and Queensland, where living outdoors is relatively easy. For as little as $10 a night at national parks and showgrounds and up to $25 at caravan parks that have showers, washing machines and other facilities, they live on the move. Dr Petra Bueskens is an Honorary Fellow in Social and Political Sciences at the University of Melbourne, a psychotherapist in private practice at PPMD Therapy and a columnist at news media site New Matilda. She is the author of Mothering and Psychoanalysis: Clinical, Sociological and Feminist Perspectives. Previous PostThe Middle East’s Next War – Joschka Fischer. Next PostThe Biggest Prison on Earth. The History of the Occupied Territories – Ilan Pappe.